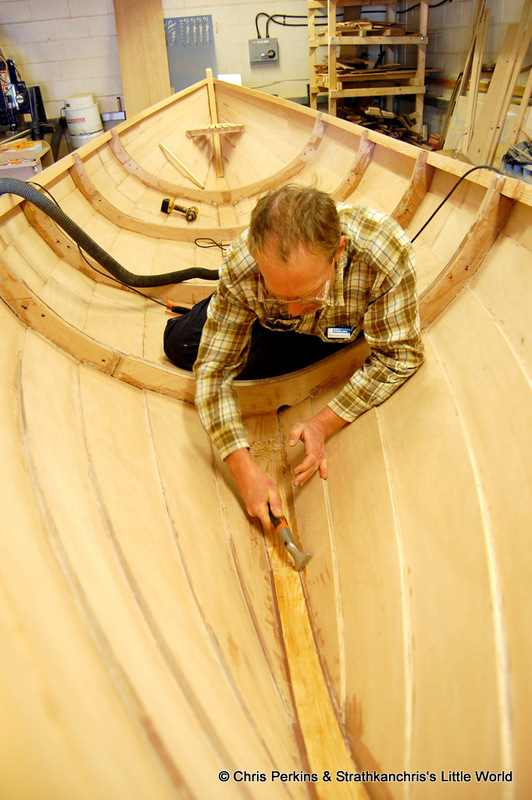 Chris Perkins’ and Alec Jordan’s latest photos of the first St Ayles skiff build, including some more shots of the increasingly well exposed Alec Jordan – I hope he enjoys his new celebrity! 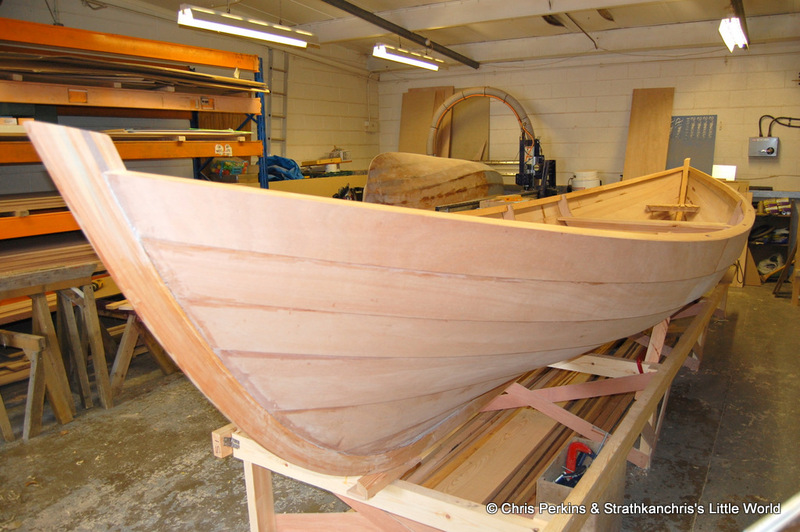 These are Chris Perkins’ and Alec Jordan’s photos showing the latest progress on the Iain Oughtred-designed St Ayles skiff currently going together in Alec’s workshop for use by the Scottish Coastal Rowing Project. For more on this story, click here. 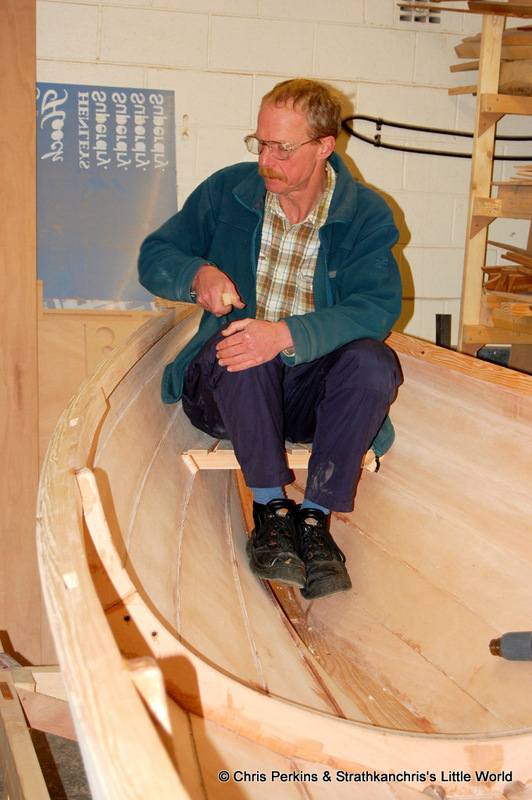 ‘A belated catch up report, for which apologies, on the progress of the St Ayles Skiff. ‘My last week on the project was spent cleaning up the inwales, building a temporary cox perch and generally helping fit the furniture and titivating. Each time this stage is reached in a build I am amazed at how much time is absorbed removing material. Work that will never be appreciated by anyone who has not got that particular T shirt but is immediately apparent if it is neglected. The route to a respectable finish always lies in the preparation – a truism that can never be said often enough in my view. ‘The snaps include a couple of high level shots showing the almost structurally completed boat, just the breasthooks to fit at that stage (now done), obtained after some precarious ladder work by Alec in the upper reaches of his workshop. ‘The cox’s seat is a temporary affair until the positioning of feet and seats are proven on the water, after which the buoyancy compartments will be retrofitted – space is pretty tight and it would be easy to get positioning wrong in a static environment – we really need to see the dynamics of the interaction of the various bodies to establish best position. ‘The week passed all too quickly and my time on the build was over. Altogether it has been a fascinating few weeks that has transformed my view of kit boats. 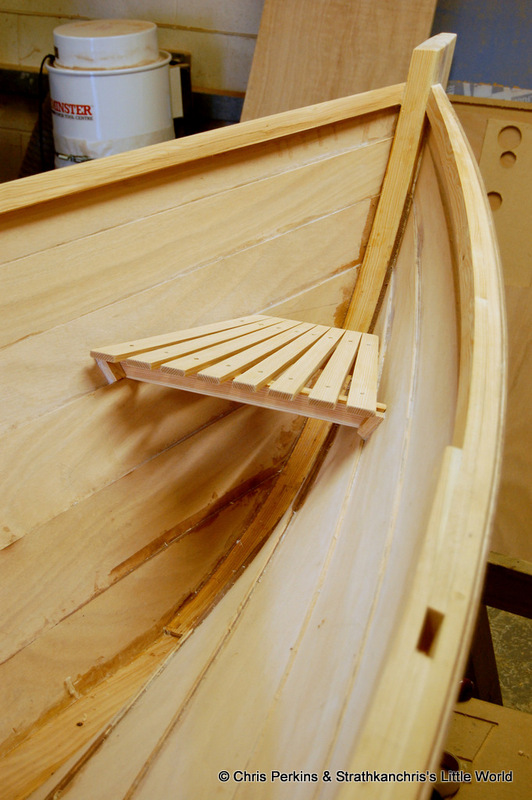 I am extremely grateful for Alec’s invitation to join in the build which I hugely enjoyed – so much so that I have put my name down for the Ullapool group aiming to build the first West Coast St Ayles skiff, although I’m not sure I have the spine to be an oarsman. ‘Alec has now started applying the finish, varnished gunnels and thwarts with the rest of the hull painted so it shouldn’t be too long before I head down to the other end of Scotland to see how she looks on the water.